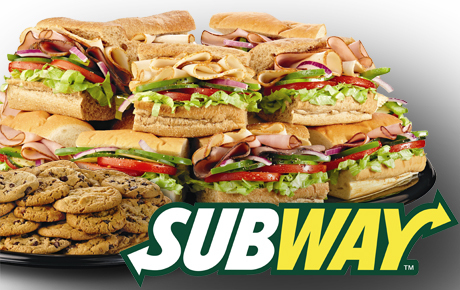 Hide deals from seller "Subway Aurora & Warrenville"
Hide deals from category "Sandwiches"
Limit 1 per person and 1 per transaction. Valid on a party platter with 12 cookies, which serves 5-9 guests. Please call ahead to place order and mention voucher when ordering. Pickup only. Promotional value expires 60 days after purchase. Subway FreshFit featuring the Veggie Delite, black forest ham, turkey breast, Subway Club and the turkey breast & black forest ham. Classic Combo featuring the cold cut combo, B.L.T., turkey breast, tuna and Italian B.M.T. Flavor Craver featuring the Subway Club, roast beef, spicy Italian, Italian B.M.T. and turkey breast & black forest ham. Create your own custom platter with any five cold sandwich selections. All platters come with 12 cookies. The owners of these Subway locations are dedicated to making sure their customers leave happy. Get your party on for less with this tasty deal from Subway. Subway in Aurora and Warrenville providing fresh, fast and healthy meals.